Closer to the tracks even than the new community garden we recently visited, this little garden caught my attention for its mulching technique. Weeds are a problem in every garden (even edibles like purslane can get out of hand) and how to contend with them is a question with infinite answers. One of my favorite answers, of course, is mulch. I've experimented a bit with living mulches in containers as well as my garden, as well as using straw or leaves. Most recently, I've tried out black plastic mulch with good results but mixed feelings. It certainly keeps down the weeds and controls erosion, but I am sometimes concerned, specifically in the case of my garlic, that it does too good of a job retaining moisture. (There was more to my garlic than the mulch, but I'm trying to think through each angle. More on that later.) Not to mention as well that plastic is plastic, and so its manufacture and disposal are less than ideal in my book. Enter this garden. 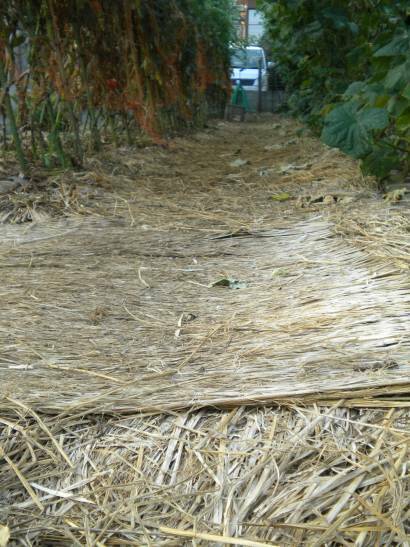 Directly below the plants the gardener uses black plastic mulch, but the paths are covered with woven straw mats. 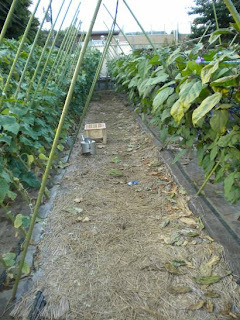 The black plastic mulch would warm the soil for the young eggplants as well as control weeds, and the woven straw mats manage weeds as well as erosion. The first time I saw it the mats were new. Two months later the mats are clearly weathered and a bit worn, but defenitely holding their own. The mats are compostable. Sturdy enough to last it seems through a season of walking, weather, and whatever else, the mats could be pitched into the compost pile when the time comes. I don't know how long they last, but undoubtedly they'd be a great addition to a compost heap. It may also be possible, depending on how the garden runs, to leave them in place and simply put fresh ones on top. The lower layer would continue to break down adding nutrients to the soil, but might get in the way of a rototiller or other tilling mechanism. The mats are water-permeable. Water can most likely get through to the soil below, which means these mats might also be good under the plants themselves. Yet, they are impermeable enough that weeds don't have an opportunity to pop up. In many ways, this (like straw or leaves) makes them an ideal mulching material. The mats are locally available. Available at stores like J-Mart, my local hardware store, and probably our local tatami mat shop, too, they don't require any special shipping. Ok, they would be a challenge to haul in my bike basket, but not impossible.